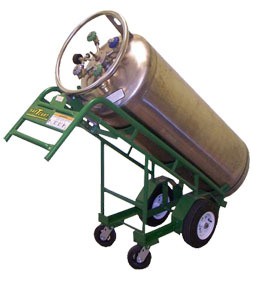 Designed to deliver a single liquid cylinder, the LCT-12-6 features an adjustable hook that allows it to carry a variety of liquid cylinders with a simple adjustment. Its pneumatic wheels roll easily over any terrain while swivel casters on its trailwheel make maneuverability a cinch. Front-mounted steel nylon/fiberglass wheels make loading large liquid cylinders quick and easy.